From the Star Wars collection by Silver Buffalo. 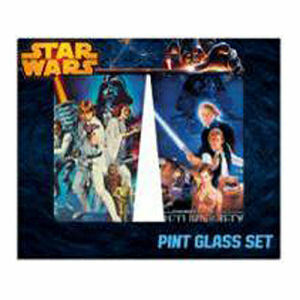 Star Wars Cast Action 16 Ounce Pint Glass 2 Pack. This Item is in stock and ready to ship. You should not postpone your purchase and miss out on adding Star Wars Cast Action 16 Ounce Pint Glass 2 Pack to your Star Wars collection! From the Star Wars collection by Silver Buffalo. Star Wars Cast Action 16 Ounce Pint Glass 2 Pack. Designs from Star Wars and Return of the Jedi . Hand wash only. Not dishwasher safe. Do not microwave.